Rich moves to Wichita, KS. to be involved with Central Christian Church. Rich (about a retreat at Central Christian Church in Wichita): "They were ordinary kids, but they knew the scriptures, which was cool. We were only there once, but those kids were constantly on my mind. Then we were in Oklahoma, and a couple of the youth sponsors from Wichita came down and joined us there. They just wanted to support us, and I had never had that kind of support before. I also had a tremendous amount of respect for one of the ministers, Morris Howard. Anyway, after a lot of prayer and thought, I decided to move to Wichita, because I wanted to be involved in this church. The ironic thing is that Morris died of a heart attack right after there. And people aren't terribly impressed with what I do, but they love me and support me and give me assignments and I'm accountable." Promo videos are made for the songs, "The Other Side Of The World" and "How Can I Keep Myself From Singing". Rich produces and plays all of the instruments on a project for Prisoners of Hope called "Choice Lifestyle". Rich also wrote "Make Me Up", "See What A Difference", "Awesome God", and cowrote "One Good Turn" with Steve Cudworth. "Could Be A Celebration" debuts on the AC Charts. It would spend 6 weeks on the chart and peak at #29. Rich Mullins travels to Guatemala as part of Teen Mania - a missionary outreach to orphans and street people. While he was there, Rich worked on a new music video. Rich travels to Korea, Japan and Thailand. Rich: "So, that summer I got the opportunity to go to the Orient. It was the year that the Olympics were in Seoul. And there was a seminary in Korea that was really anxious to get their students really good at speaking conversational English. And so part of their plot and plan was to have some American come over and just hang out with students. So I got to go to Korea and hang out for a month, just talking with students. Then after I did that, went to Japan, and got to visit an old friend of mine there, and do some concerts, which was very, very interesting. Then we went to Thailand, which was really, of everything that happened on that particular trip, Thailand had probably the greatest impact on me. At the time we were getting ready to leave, we had been in a Chinese refugee camp. And I had played the dulcimer for them, and all that sort of thing, and they were so fascinated by that. 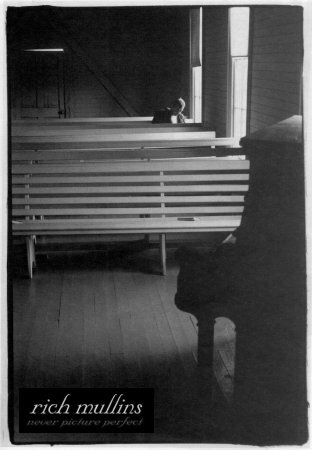 And it was wonderful playing for the Chinese refugees, because of all the people I've ever played for, when I started playing the dulcimer, rather than sit there and listen, they all got up, and they would touch it, and they would, you know, while I'm playing. It was wonderful. They were so curious. They were so interested in what was going on. " Upon entering a village in Thailand, Rich and his group were greeted with a group of children singing a song in a mixture of Thai and Lisu. The short verse roughly translates to "Pray to God. Pray to God. It will be cool with you if you Pray to God." This song became the introduction to "The Other Side of the World" on Rich's next album. About an hour and a half before a service in Thailand, Rich wrote "The Other Side of the World." He and Steve Cudworth performed it at the service. Following his trips overseas, Rich enters the studio to record what he thinks may very well be his final album. He ended up recording Winds Of Heaven, Stuff Of Earth, - a true breakthrough album for Rich. 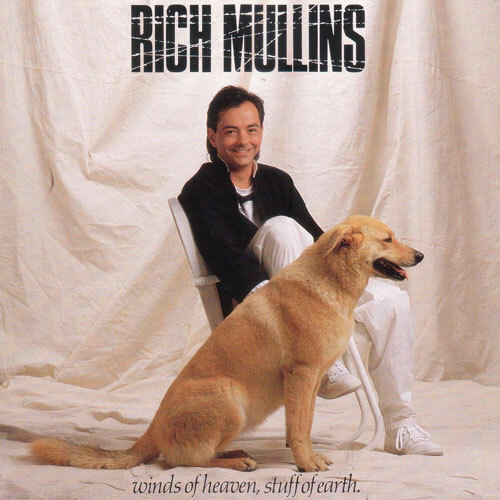 Rich Mullins third album Winds Of Heaven, Stuff Of Earth, is released on Reunion Records. The album would receive spot number 31 in the 2001 book CCM Presents: The 100 Greatest Albums in Christian Music. The Dog on the cover of the album is Rich's dog Curry. Rich, on "Awesome God": "You know, the thing I like about 'Awesome God' is that it's one of the worst-written songs that I ever wrote; it's just poorly crafted. But the thing is that sometimes, I think, that when you become too conscientious about being a songwriter, the message becomes a vehicle for the medium. This is a temptation that I think all songwriters have. I think a great songwriter is someone who is able to take a very meaningful piece of wisdom - or of folly or whatever - and say it in a way that is most likely to make people respond. But, what you want them to respond to is not how cleverly you did that; what you want them to respond to is your message." For information on how the song was written, see July 1987 in the TimeLine. This track became Rich's second #1 single. It was given 1st place in the 2006 book CCM Presents: 100 Greatest Songs in Christian Music. It was also voted one of the top 3 most popular Contemporary Christian songs of the decade. "If I Stand": The song was actually written - at least in part, more than a decade earlier in the Fall of 1975. "The Other Side of the World": The intro is a song that the children in Thailand sang to Rich and the other members of his group when they entered the village. The short verse (which is a mixture of Thai and Lisu) roughly translates to "Pray to God. Pray to God. It will be cool with you if you Pray to God." Reunion Records releases a video collection entitled 4X4, which includes Rich's promotional videos for "How Can I Keep Myself from Singing" & "The Other Side of the World". "Awesome God" debuts on the AC Charts. It would spend 18 weeks on the chart and peak at #1 on October 3. CCM Magazine Reviews Rich's Winds of Heaven, Stuff of Earth. "Awesome God" hits #1 on the AC Charts. The song would spend a total of 18 weeks on the chart. Calendar Magazine Reviews Rich's Winds of Heaven, Stuff of Earth. "The Other Side of the World" debuts on the AC Charts. It would spend 14 weeks on the chart and peak at #5. Rich Mullins performs in Godfrey, IL at Lewis and Clark Community College. Calendar Magazine includes a short article on Rich.